To celebrate the 25th anniversary of the first issue of the Dark Horse Predator Comic, NECA has released a figure based on the first issue. The Dark Horse Predator, a repaint of the previous Jungle Hunter Predator, features a deco based on the Predator seen on the cover of the first issue. The comic, which follows the brother of Dutch Schaefer (Arnold Schwarzenneger) as he battle the Predator’s that have infiltrated his city. The figure includes an all new staff accessory to help give it a more accurate look. Also included is a reprinted copy of Predator #1 by Dark Horse. Toyark sponsor Big Bad Toy Store has provided us with the figure, and I have a full gallery and review to check out. 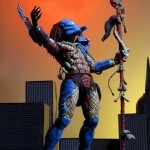 To celebrate the 25th anniversary of Predator #1 from Dark Horse Comics, NECA is releasing a special Predator figure. The classic Predator figure gets repainted to match the look of the issue #1 comic cover. We previously saw this back in January. Now NECA has released an image showing the interior packaging and the included mini-comic. NECA has posted an image of a new Predator figure. The figure is a repaint of their Classic Predator mold. It’s repainted to look like the Predator seen on Dark Horse’s Predator #1 Comic for the 25th anniversary of the issue. Now word on release date at this time. Check out the pic after the jump.